"I confess I was very anxious to find out if I was actually the first who applied the principles of geometry to matters of finance, as it had long before been applied to chronology with great success. I am now satisfied, upon due enquiry, that I was the first; for during 11 years I have never been able to learn that anything of a similar nature had ever before been produced. "To those who have studied geography, or any branch of mathematics, these charts will be perfectly intelligible. To such, however, as have not, a short explanation may be necessary. "The advantage proposed by those charts, is not that of giving a more accurate statement than by figures, but it is to give a more simple and permanent idea of the gradual progress and comparative amounts, at different periods, by presenting to the eye a figure, the proportions of which correspond with the amount of the sums intended to be expressed. "As the eye is the best judge of proportion, being able to estimate it with more quickness and accuracy than any of our other organs, it follows that wherever relative quantities are in question, a gradual increase or decrease of any revenue, receipt or expenditure of money, or other value, is to be stated, this mode of representing it is peculiarly applicable; it gives a simple, accurate, and permanent idea, by giving form and shape to a number of separate ideas, which are otherwise abstract and unconnected. In a numerical table there are as many distinct ideas given, and to be remembered, as there are sums, the order and progression of those sums, therefore, are also to be recollected by another effort of memory, while this mode unites proportion, progression, and quantity all under one simple impression of vision, and consequently one act of memory. " 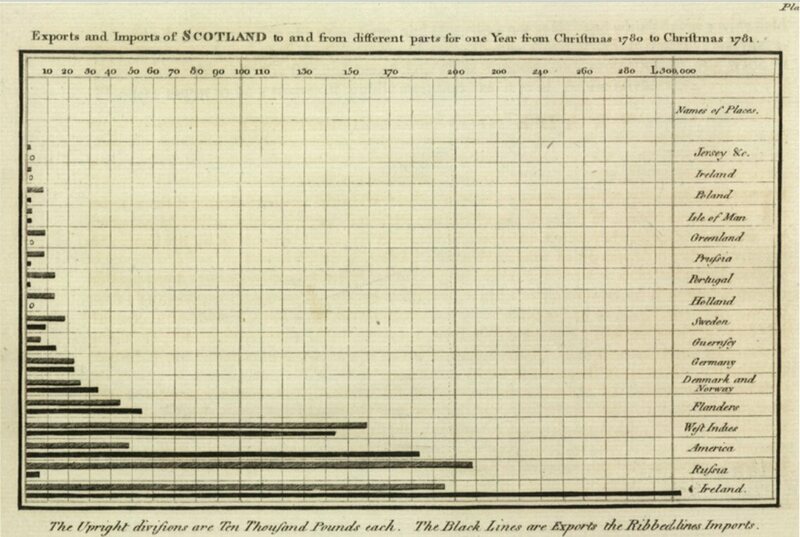 Cara Giaimo provides an overview of Playfair's story in "The Scottish Scoundrel Who Changed How We See Data: When he wasn’t blackmailing lords and being sued for libel, William Playfair invented the pie chart, the bar graph, and the line graph," appearing in Atlas Obscura (June 28, 2016). Giaimo described Playfair as a "near-criminal rascal." He apprenticed with James Watt, of steam engine fame, failed at silversmithing, falsely claimed to have invented the semaphore telegraphy, tried blackmailing a Scottish lord, sold tracts of American land he didn't actually own to French nobility, and died in poverty and obscurity. For some additional detail on Playfair's colorful life, Giaimo links to a 1997 article, "Who Was Playfair?" by Ian Spence and Howard Wainer. But for social scientists, what's interesting is that Playfair pushed back against the style of argument of his time--mainly verbal persuasion and perhaps a few tables--and invented these graphs. For example, here's the first bar chart, showing Scotland's trading partners. 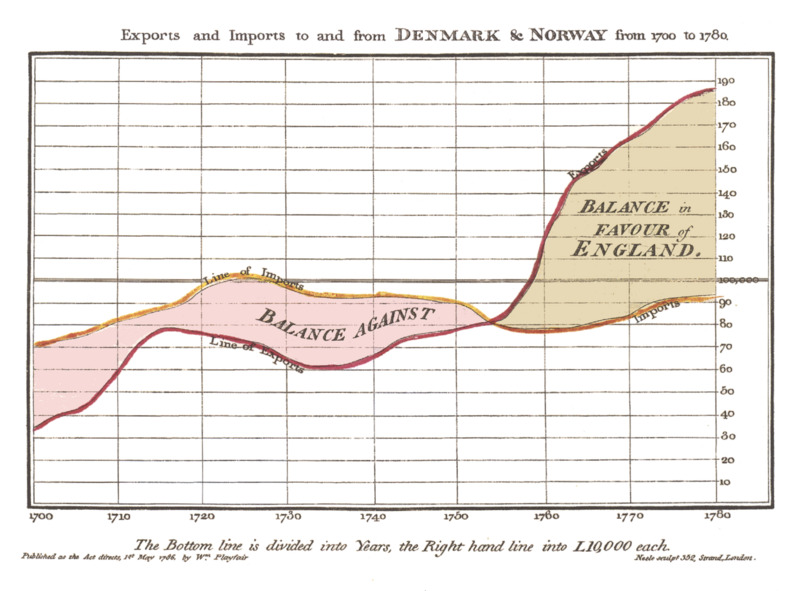 Here's an early line graph from Playfair's 1786 atlas, showing England's imports and exports to Denmark & Norway in the 18th century. And Playfair wasn't done. In his 1801 book The Statistical Breviary, he invented the pie chart. It appears in the middle of a group of other circular charts, and shows Turkish land holdings. Moreover, Playfair hand-colored the "slices" of the pie, thus initiating the idea of color-coding. Here's the overall page, followed by a close-up of the pie chart itself. 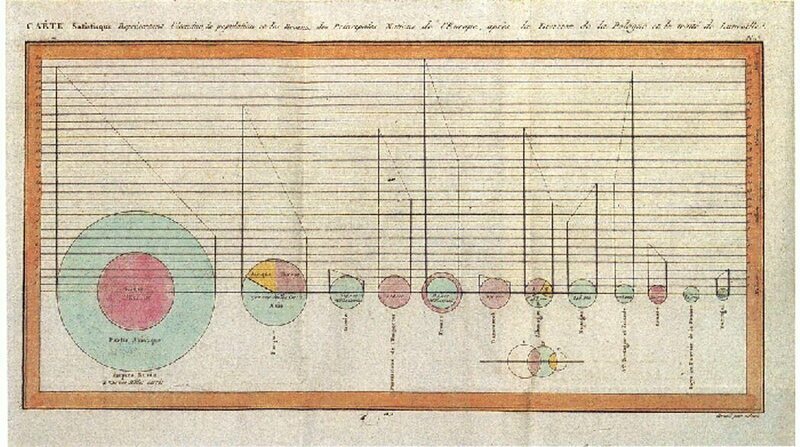 I suspect that the invention of the line graph, bar graph, and pie chart were--like so many inventions--something that would have been invented during this time frame by someone, and sooner rather than later. But Playfair was first, and deserves the credit. Homage: I ran across the Giamo article thanks to Tyler Cowen and the always-intriguing Marginal Revolution blog. What Structure Are Academic Researchers Building? Will the China Shock Operate in Reverse?